Esther Bubley and Helen Levitt are both born and raised Jewish American photographers. Both artists lived in a time when segregation was a big part of American culture. 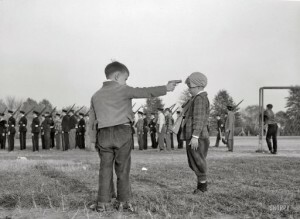 Although they both had an array of photo subjects, they shared the same amusement in children. Their main focuses were capturing normal people going about with their every day normal lives. Their presence as photographers was mostly unseen by their subjects; photos they took have a genuine feel to them. Compairing “Birthday Children” by Esther Bubley and “Two Kids Dancing” by Helen Levitt reveals much similarities between the artists. Esther Bubley was born February 16, 1921 to two Russian Jewish immigrants in Phillips, Wisconsin. Her inspiration to become a photographer came from the first issue of Life magazine. In 1941, after college, she started her work and moved to Washington. 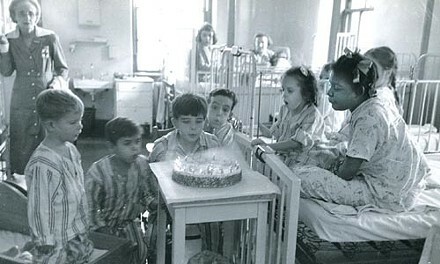 In 1947 she landed a working for the Children’s Bureau, a Federal child welfare agency. Her time of work was considered “the golden age of photo journalism”( Jean Bubley) in America, which is one of the reasons her photos became so popular. Her main topics of interest included children, the oil industry, bus travel, mental hospital, and cape Canaveral. Although she did photograph many famous people of the time, one being albert Einstein, she really preferred taking photos of ordinary people doing ordinary things. Her presence as a photographer was very reserved, which let her capture the candid images that she did. “The way she photographed human emotion, human feeling, just transcends the time in which the photographs were taken”( Jean Bubley). 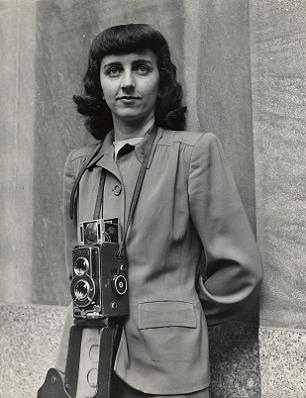 Portrait of Esther Bubley by John Vachon, 1944. 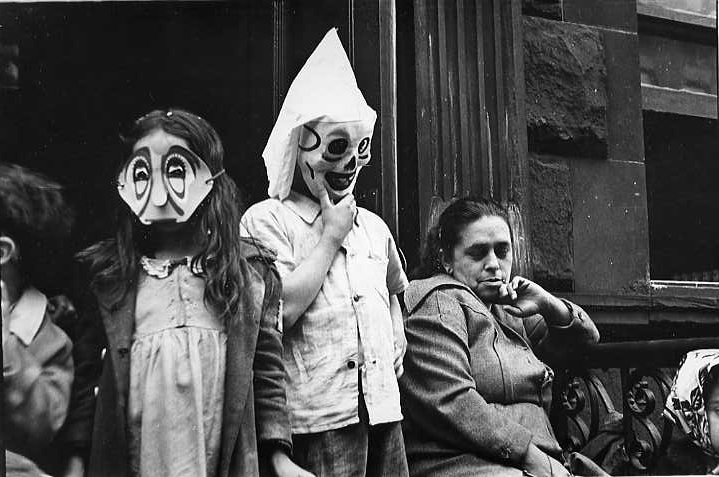 Helen Levitt was born in Brooklyn, New York in 1913. She dropped out of high school and started in the photography business at a young age. Her love for photography was deep; she explained how “photography was the only way she knew how to express herself”(Obit). She was very intrigued by the chalk art that was done by the children of New York. 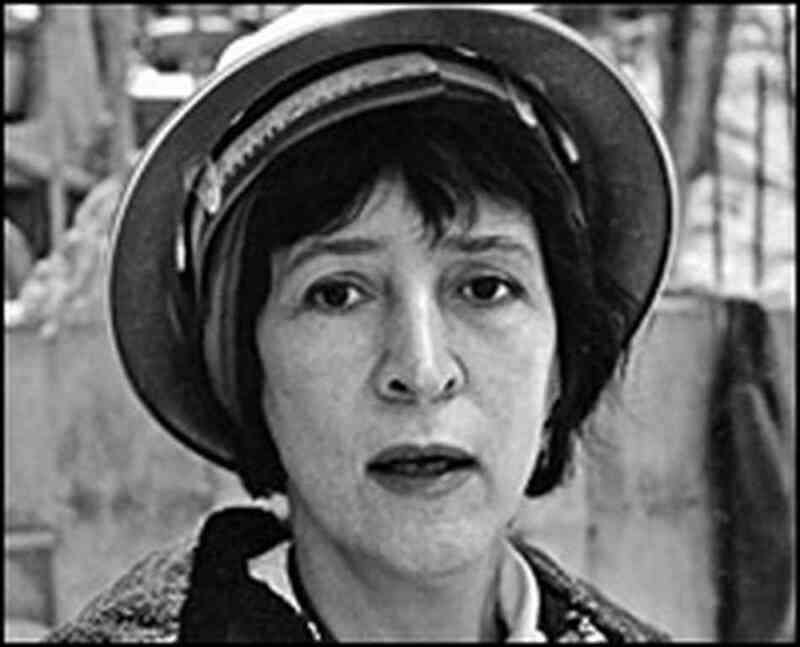 Like Esther, the main focus in most of her photos was “men, women, and children living it out on the streets and among the tenements of New York”(miller). She had much early success and in 1943 she had her first solo exhibition “Photographs of Children”. Helen was very particular about how she took her photos. Her photos represented a vision of New York undisturbed. She even purchased a false lens so her subjects wouldn’t know when she was taking a picture of them. 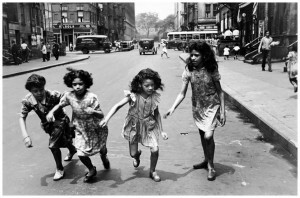 Working on the streets of New York, Helen was able to capture people (especially children) in their natural environments; the streets were where the city children spent most of their free time. Helen’s work was mostly in black and white, “but as soon as color film became available, she jumped at the chance to document the city in vivid color”(reelfoto). Helen Levitt, circa 1963, while producing the film An Affair of the Skin by Ben Maddow. 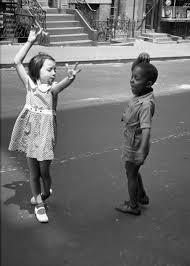 Helen Levitt’s photo, “Two Kids Dancing” is one of her most popular photos of children. The photo depicts two kids dancing on the street, one white girl and a black boy. The girl is in mid twirl, with her arms flailing out wide, while the boy is doing a more reserved dance. They seem to be dancing together and having fun despite their different races. The attraction in this photo is the fact that two interracial children are both playing together. The photo was taken at a time where segregation was a big part of American culture, but remained a small impact on the children of that era. Although Helen took un-staged photos, the fact that the white girl is in the sun while the black boy is in the shadow is important to note. Weather this was on purpose or not, it is a good indication of racial boundaries of the time. Children in America clearly amuse both Helen Levitt and Esther Bubley. Both of them were born into Jewish American families and shared the same passion for photography. The two pictures I choose are very similar in the messages they convey. The beauty in children is that they don’t seem to care about the physical differences amongst each other. They live to play and have fun without racial boundaries that would stop them from doing so. In Easter’s photo, the children all blow the candles out as a group. There is not a single hint of segregation or racism among them. Helens photo also shares the same idea of erasing boundaries; the children are dancing together and aren’t affected by their different skin color. Both photos are ethnographic , making their message genuine and even more powerful. Easter and Helen would probably agree that there is a lot we can learn from observing children. Their work fell at a time when America was separated by racial boundaries, and both photographers strived to show moments where these boundaries didn’t exist. Max Kozloff, “A Way of Seeing and the Act of Touching: Helen Levitt’s Photographs of the Forties,” in The Privileged Eye (1987), 29-42. 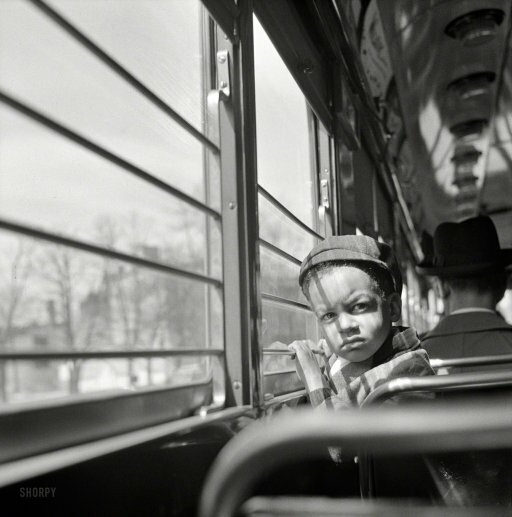 You’ve made an excellent pairing of photos that both address the theme of children’s ability to ignore racial differences as captured by Helen Levitt and Esther Bubley. I think that your discussion of the photos is very good as are your brief biographies of the photographers. 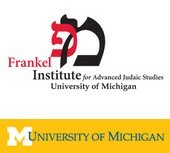 You could have strengthened the connection of their anti-racism with their Jewish self-understanding. One of the videos you chose is great (the obit); the other one of the color slides taken at a gallery is not very good and doesn’t add to the post. I like your choice of portraits of each of the photographers and the credit you give to the photographer who took the picture. If the thematic analysis is thoughtful, the post suffers from some typos and your practice of calling Levitt and Bubley by their first names. Usually one discusses a photographer using his or her last name, especially if you were not a friend on a first name basis.